Green chilaquiles always remind me of my pebbled street walks on the car-less streets of Oaxaca. Passing church after beautiful church and determined to spend my morning meal at one my favorite restaurants, Las Quince Letras. Surrounded by cobalt blue and marigold walls with fuchsia bougainvillia tree accents, the restaurant’s fresh morning patio was serenaded by songbirds and a trickling pitter-patter of a corroded fountain. Chilaquiles are the quintessential any-time-of-day meal in Mexico. For breakfast, add scrambled eggs. For lunch, add shredded chicken. Vegetarian? 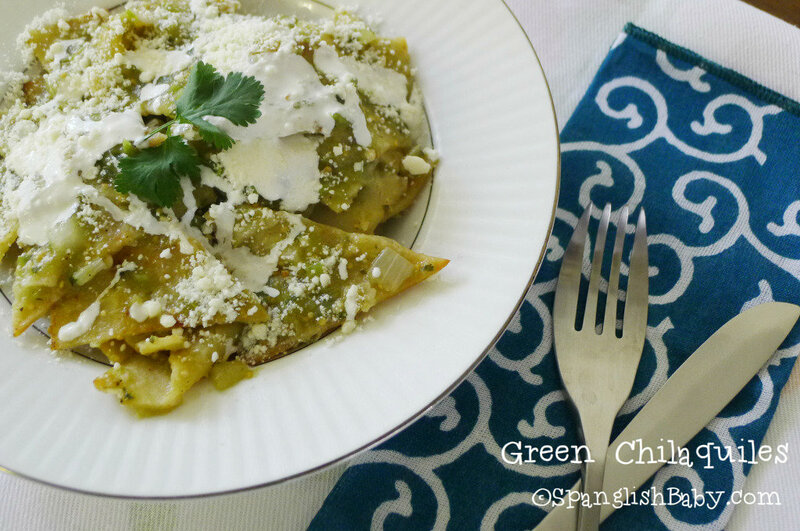 Enjoy this tangy green chilaquiles dish as is or add roasted mushrooms. I like to top mine with salty, crumbled cotija cheese and cream (mild crema Mexicana or sour crema Salvadoreña, your choice). Important note: If tortillas are fresh, spread them out over a flat surface about 30 minutes before frying. In a medium skillet, heat about a ½ inch depth of oil until hot. Fry tortilla pieces until golden. Drain on paper towels and set aside. In the same skillet, remove all oil but 2 tablespoons. Cook chopped onion for about 4 minutes. Set aside. In a deep pot with water, cook tomatillos until tender, 5-6 minutes. Drain and place in blender. Add ½ cup of chicken broth, onion, both chilies, cilantro, oregano, salt and sugar. Blend until nearly smooth. Arrange fried tortilla pieces on an 8-inch square baking dish, then carefully and evenly pour sauce over them. Sprinkle with cheese. Cook for 12-15 minutes until heated through. Serve hot and top with Mexican or Salvadorian cream. You can find dried Mexican oregano in practically any grocery store. Good luck! Enjoy! This brings back soo many memories! This is my all time favorito! Every time I flew to the D.F. for trainings at our headquarters, I had to make a stop for my Chilaquiles antojos! Gracias for the recipe! Target and attract prospects that are interested in what you are selling. Article marketing has become increasingly popular as a marketing method under the Web 2.
do or what you sell and can even be a “storefront” for selling goods and services directly.